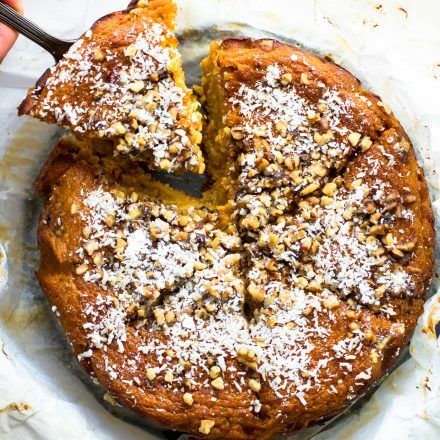 A Paleo sweet potato pie recipe that’s IMPOSSIBLE to mess up! Made with simple healthy ingredients and this pie forms its own crust while baking! a little over 1/2 cup of tapioca flour. Between 1/2 c to 2/3 cup. Preheat oven to 350F. Line a pie pan or cake tin with parchment paper. In another small bowl, sift your coconut flour and then combine with your tapioca flour, spices, salt, baking powder. Mix together. Mix your dry batter with your blended egg/sweet potato batter. Stir together until smooth. Fold in about 1/2 cup or more of your coconut flakes. Pour into your prepared pie or cake pan. Sprinkle a handful of pecans on top. Bake for 50 minutes, cover will foil, then bake for 15 -20 minutes more. The edges will be crispy brown. If you are not serving this right away, place pie in the refrigerator to set more. It will still be custard like in the middle. Sprinkle with the remaining coconut flakes and powdered sugar if desired before serving. Baking times vary depending on your oven and the type of milk you use. Keep watch after 45 minutes. I prefer canned sweet potato puree if possible. Farmers Market has a great organic puree brand. If you are not serving this right away, place pie in the refrigerator to set more. It will still be custard like in the middle. Simply pop in oven to warm again before serving. THe pie will not have as much height after cooling and being refrigerated, but still tasty. Pumpkin puree will also work if you don’t want to use sweet potato. If you are looking for a paleo whipped cream to go on top, try my coconut whip frosting. Nutrition shown is per slice, without nuts.